Written by: Mickey Richardson on December 8, 2016. John Lennon was born in Liverpool, England on October 9, 1940 during a German air raid in World War II. Though he survived five years of bombing raids by the Germans, John was gunned down by a deranged fan over 30 years ago. John Lennon playing his Gibson Les Paul Junior, Live at Madison Square Garden! John is primarily known as a member of The Beatles, but John kept himself busy with many other activities. He was an artist, author, actor, political activist, but most prominently, Lennon was a singer, song writer, and guitarist. As a matter of fact, John’s evolution to guitar began when as a young child, his mother Julia taught him a few banjo chords. By the age of 16, John had his first guitar and shortly afterward, John Lennon was in a band with Paul McCartney and George Harrison. Did you know that back when John, Paul and George first formed a band, all three of them played guitar?! John sitting back and riffin’ on his 1965 Epiphone Casino! Who Exactly was the Walrus? Some of Lennon’s classic songs written and recorded during this era include: A Hard Day’s Night, Norwegian Wood, In My Life, I Am the Walrus, Strawberry Fields Forever, A Day in the Life, Help!, Ticket to Ride, All You Need Is Love and dozens more. John Lennon, Eric Clapton and Keith Richards jamming! Fast forward through Beatlemania and you’ll find that Lennon partnered up for a brief stint with legendary guitarist, Eric Clapton. Lennon first met Clapton back in 1964 while The Beatles were touring with the Yardbirds. Lennon’s association with fellow Brit guitarist, Eric Clapton began when Clapton laid down lead guitar licks on The Beatles track, While My Guitar Gently Weeps. Later, in September 1969, Lennon and Clapton shared guitar duties live on stage during the festival, Live Peace in Toronto with the Plastic Ono Band. The Plastic Ono Band headed to the studio where John took back primary guitar duties. During the next 5 or 6 years, Lennon recorded dozens of songs including several classics such as: Imagine, Mind Games, God, Instant Karma, Jealous Guy, #9 Dream and the list of goes on and on. John and Yoko’s son Sean was born on John’s 35th birthday, October 9, 1975. At this point John hung up the guitar (behind the bed) and didn’t pick it up again for about 5 years. Though playing daddy daycare came to an end for John in the Summer of 1980 when while in Bermuda, John wrote the songs for Double Fantasy and Milk and Honey. Plenty of great songs came about including: (Just Like) Starting Over, Watching the Wheels, Woman, Borrowed Time and Nobody Told Me. 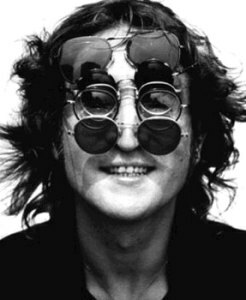 Aside from his musical talents, John Lennon was also known to be the quintessential class clown and always able to make others laugh. Check out this rare footage of John horsing around and it just might bring a smile to your face. Thank you for reading! We hope to see you on the SMG Social Network for Guitarists! JOIN HERE!!! SMG Poll: What is Your Favorite Guitar Solo? SMG Poll: Who’s Your Favorite Guitarist/Bassist Duo? SMG Poll: Who is the Most Influential Guitarist? SMG Revised: Being a Female Guitarist Takes Balls! SMG Poll: Who is the Best British Guitarist? © 2019 ShareMyGuitar Blog. All Rights Reserved.